Frequent bathroom trips, especially at night, and incontinence episodes can have a huge impact on a residents' quality of life and health as well as the revenue for the facility. While there are oral medications to treat OAB and the symptoms of urgency, frequency and urge incontinence, there are significant concerns about the safety of anticholinergics, especially when used in the elderly. Fortunately, the Urgent PC Neuromodulation System is available to deliver percutaneous tibial nerve stimulation therapy (PTNS) to OAB patients who don’t respond to other treatments. 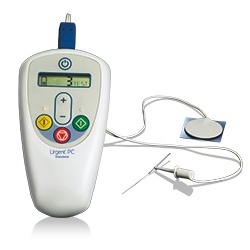 Urgent PC is a very portable therapy, only requiring the hand-held Urgent PC Stimulator and a disposable Urgent PC Lead Set. During treatment, the patient sits comfortably, fully clothed with a foot elevated. A slim 34-gauge needle electrode is temporarily placed at a 60-degree angle near the ankle and then connected to an external stimulator which produces mild electrical impulses which travel through the lead set then up the tibial nerve to the sacral nerves, which are responsible for pelvic floor function and voiding. Depending on your facility, Urgent PC may also be a therapy that could be administered to multiple residents at once in a group setting. The treatment is recommended in the American Urological Association (AUA) guideline for the treatment of OAB and has seen widespread use by Urologists and other clinical specialists since 2003. The treatment begins with 12 weekly, 30-minute treatments. After the initial 12 sessions, successful patients usually need about one treatment a month to sustain symptom improvements. Urgent PC has proven clinically effective in up to 80% of patients, regardless of age or gender. After more than 50 studies, it is clear that Urgent PC improves quality of life. Treatment decreases urinary incontinence episodes and nightly bathroom trips, noteworthy results given the new research linking OAB and dangerous falls. Senior care facilities expend staggering amounts of extra resources in staff time and budget to care for residents with incontinence and OAB. The costs of absorbent pads, laundry, bed alarms, nursing time, medications and ointments all add up, not to mention the risks of residents rising multiple times overnight. A study presented at the 2015 AUA Meeting showed a correlation between OAB and an increased likelihood of falls. People with an OAB diagnosis had a 40% higher risk of falling compared to people without an OAB diagnosis, while OAB treatment reduced their fall risk compared to those who did not receive treatment.